Sometimes you make a dinner and you immediately know it will be going into heavy rotation for years to come. That was definitely the case with this chicken stew. 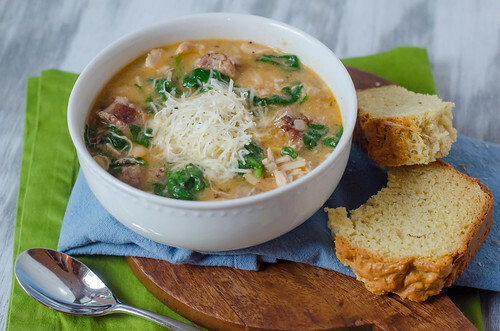 It seems so humble - chicken thighs, Italian sausage, white beans, and spinach. But something magical happened in my crock pot that day. The chicken was so tender and flavorful. The sausage was rich and just slightly spicy. The white beans made the stew so creamy and hearty. And the spinach gave it a nice freshness. Topped with some shredded Parmesan cheese, and served with a thick slice of bread, this was pretty much the epitome of the perfect fall dinner. Something about the combination of all the ingredients just seemed so right. I'm not one to turn my nose up at leftovers as a general rule, though it's not too often that I look forward to them with great enthusiasm. However, I ate the stew for lunch every single day the week I made it, and I never grew tired of it. I had actually intended to freeze half of it (time to stock my freezer for the babies! ), but I wasn't willing to part with it quite yet. The bright side is that since it comes together rather quickly and then cooks all day, it will definitely be making another appearance around the same time as these baby boys! Season the chicken well with salt and pepper, and transfer to the slow cooker. Heat the olive oil over medium-high heat and brown the sausage about 1-2 minutes per side. Transfer to a cutting board until cool enough to handle, then slice into 1/2-1 inch slices (It probably won't be cooked though - don't worry, it will finish cooking in the slow cooker!). Add to the slow cooker with the chicken. Pour off all but 1 tablespoon of fat from the skillet, and add the onions. Cook, stirring often, until softened and lightly browned, 5 to 8 minutes. Stir in the garlic tomato paste, thyme, and red pepper flakes, and cook until fragrant, about 1 minute. Stir in the flour and cook for 1 minute. Slowly whisk in the wine, scraping up any browned bits from the pan. Whisk in 1 cup of the broth, whisking to smooth out any lumps. Transfer to the slow cooker. Stir in the remaining 2 cups of broth, the bay leaves, and the cannellini beans. Cover and cook until the chicken and sausage are cooked through, 6-8 hours on low (or 3-4 hours on high). Transfer the chicken to a cutting board and use 2 forks to shred into bite-sized pieces. Fish out the bay leaves. If there appears to be a lot of fat on the surface, use a large spoon to skim it off. Return the chicken to the crockpot and stir in the spinach. Cover and cook on high until heated through and the spinach is wilted, about 5-10 more minutes. If the stew is too thick, stir in additional (warmed) broth. Season to taste with salt and pepper. Top each serving with grated parmesan before serving. I love it when seemingly simple and boring dinners end up being something to write home about! This sounds like comfort food to the max. Umm this sounds great. I'm on the hunt for a few more crock pot recipes to throw in the rotation! I'll definitely be giving this one a try! I'd love to have this as leftovers! oh gosh I pinned this - must make. I love trying new soups...and then in the crock pot yeah! I'm building my list of slowcooker recipes to try and this one has definitely earned a spot! It sounds so warm and comforting! I made this tonight. I was going to save it for the crock pot, but I was too anxious to try it. I'm so glad you posted this because it was absolutely fantastic!!! Made this last week and it was so so good. Lasted me for many lunches. Thanks for the recipe! First, congrats on the bebes! Hope y'all are adjusting well. I recently made this,and me and the husband gave it two thumbs up. I did add a carrot to the mix for a little extra veg and used kale instead of spinach. I liked it so much that I sent the recipe to my mom who made it this week. She called to tell me that my brother and my dad said it was the best soup she has made. Ever. They think pretty highly of her cooking so I figured that was quite impressive. I thought you would appreciate hearing that. Cori, I'm glad to hear it was a success! I love the idea of adding carrots and kale as well. Thanks for letting me know! Really great recipe! I used halved brussel sprouts instead of spinach and added carrots. I also topped it with Trader Joe's "south African smoke seasoning blend" -- which took the dish from good to fantastic!